Now music is inseparable from human daily life., become a part of our life. If you your children love music,I think yo should support it. u not only support it by giving them the musical instrument. You can also give them toys that related to music such as Music T-shirt for children. It is a t-shirt-formed guitar. This toy is really fantasting because the guitar is fully playable and the sound is also great. The buttons are major chords and you can play it with very little skills. The electronic guitar t-shirt has great sound because all major chords are recorded from real guitar. You can play dozens of song by touching the button on the neck. Those Electronic Guitar T shirt is designed to give the user fun activity playing the guitar while doing their daily activity. 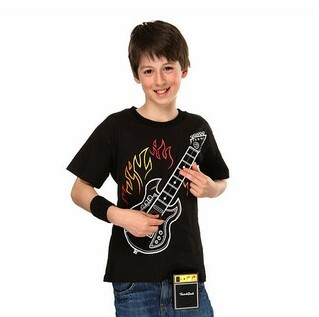 The electronic rock guitar shirt is preset with some modes,I think your children are going to love it. As if you play with the real guitar you will also be able to strum. To have louder sound, theelectronic guitar t-shirt has mini amp and you can Play Guitar in T shirt with adjusted volume by touching the tone knob on the amp device.